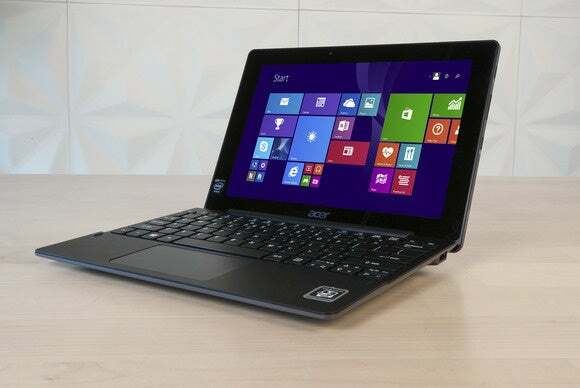 Acer's Aspire Switch 10 E shows hybrid's don't have to be terrible. It's a laptop! It's a tablet! It's…the Acer Aspire Switch 10 E. Yes, the most portable of the laptops we looked at in the $500 tier is also the weirdest, being that it's one of those "tablet hooked to a keyboard" hybrid deals. Or sometimes it's a "tablet not hooked to a keyboard," depending on what you're doing with it. Is it powerful? No. Is it going to be practical for everyone? Absolutely not. But it's actually one of my favorite machines in this round-up, even if it will only attract a very specific niche. The first thing that will surprise you about the Acer Aspire Switch 10 E is that it's heavy. Now, weight-wise the Switch 10 E isn't very different from the competition. It's 2.5 pounds, which is almost identical to the Lenovo S21e's netbook-esque dimensions. And that makes sense, when you look at the Switch 10 E in its standard clamshell configuration—it looks like a netbook, complete with the requisite grey-ish/lavender "brushed metal" plastic casing. But pick up the S21e and the Switch 10 E at the same time and you'll immediately notice the difference—2.5 pounds concentrated in the base of the laptop is extremely different from 2.5 pounds split across the base and the lid. Due to the fact the Switch 10 E's screen is also a tablet, the internals are mostly concentrated in what looks like the "lid" of the laptop. It's a top-heavy machine, and one that's prone to falling over backwards like a baby who hasn't quite learned to walk yet. 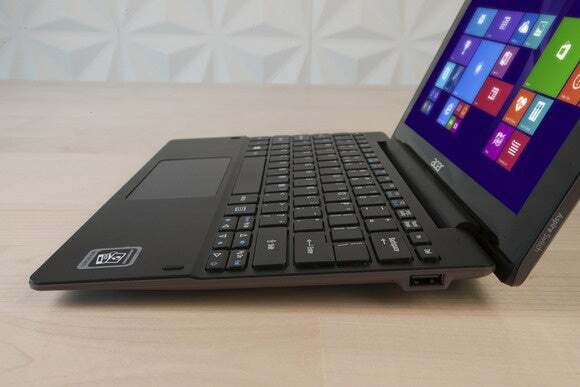 It's the compromise you make to have a laptop/tablet hybrid like the Switch 10 E. And aside from the weight, the Switch 10 E is remarkably well-designed. Unlike many other hybrids, which typically use hinges that click together mechanically, the Switch 10 E's hinges are magnetic. This gives it a solid grip I've never seen in any other hybrid—so solid I turned it upside down and waved it around, but the Switch 10 E stayed in one piece. That's impressive. The machine's easy to pull apart by hand though, and you can use it as a standard laptop, a tablet, or that weird thing where you turn the screen upside down and mount it back on the keyboard like a picture frame. The screen itself is a quality 10.1-inch IPS display, though limited to 1280x800 resolution. That's not too big a detriment for a ten-inch laptop though, and the vividness of colors (even off-axis) makes the Switch 10 E's glossy display easily one of the best in this set of reviews. I can't say the same of the speakers. Small laptop means small speakers, and the Switch 10 E's sound quality is predictably poor—mostly treble, and not very loud either. Expect to use headphones with the Switch 10 E.
The keyboard also suffers a bit for having to fit on a ten-inch machine. It's small, and although the keys have a semi-satisfying click you've barely pressed one before it bottoms out. It's a keyboard you would only type on in emergencies—definitely not something I'd want to use day-in-day-out as my standard work machine unless I had a spare keyboard to attach. The trackpad is the same—high quality, but extraordinarily tiny. Luckily you also have an extremely-responsive touchscreen accessible at all times, so when you get fed up using the ant-sized trackpad you can just stick your grubby finger on the screen instead. And as for ports, they're on the lid too. Well, everything except for a lone USB 2.0 slot built into the base. On the left of the lid you have micro-USB (for power), micro-HDMI out, an audio jack, and a microSD reader. The right side of the lid has the power button, a volume rocker, and the Windows key. When it comes to performance, someone in this set of reviews had to be crowned "the worst," and unfortunately that award goes to the Switch 10. And no surprise there, because this thing is more of a tablet-hooked-to-a-keyboard than a laptop-sans-keyboard. Inside the lid, the Switch 10 packs a tiny little Intel Atom Z3735F clocked at 1.33GHz (a.k.a. a tablet processor) with integrated Intel HD Graphics and 2GB of RAM. So while the Switch 10 runs a full version of Windows 8.1, expect performance on par with a tablet and not a laptop. In PCMark 8, the Switch 10 hit a mere 1,070 in the Home Conventional test—which measures standard use cases like web browsing, video chat, et cetera. What does that score mean for you? It means even everyday tasks will feel a bit sluggish on the Switch 10—an impression I can confirm after some hands-on time. Loading up a web page or typing in Notepad felt slower on the Switch 10 than any other machine I used for this round-up. Compare the Switch 10's 1,070 score to a full-fledged laptop like the Dell Inspiron 15 5000 for instance (2,210) and you can easily see the performance gap. o feature something other than a standard hard drive in this round-up, alongside the HP Pavilion and Lenovo S21e. And while the included 64GB is small, you've at least got a 500GB hard drive as backup storage in the Switch 10 (in the model we reviewed, at least). That hard drive is interesting—it's the only part (as far as I can tell) that's stored in the base of the Switch 10. When you disconnect the lid from the keyboard, the hard drive also disconnects. I do wonder how the integrity of the hard drive would hold up over time if you accidentally remove the tablet portion while transferring files, but didn't manage to cause any major errors during my time with the Switch 10. More worrisome is the fact the hard drive tends to consider itself "disconnected" if you accidentally jolt the laptop—you'll occasionally see the "Tap to choose what happens with removable drives" dialogue pop up while working. The Switch 10 is about on par with its larger cousin, the Aspire E-15, as far as unnecessary third-party software is concerned. McAfee rears its ugly head here again, with a constant stream of unwanted pop-ups. But there's also a presence from Amazon, Spotify, Flipboard, Evernote, Music Maker Jam, Netflix, and Hulu Plus. And then there's Acer's suite of useless and semi-useless software: Acer Explorer, Acer Portal, Acer Care Center, Acer Screen Grasp, Acer Touch Tools, and et cetera. Like the E-15, this stuff is relatively benign—more an annoyance than anything else. I like the Acer Aspire Switch 10 E. Yes, it's the least powerful machine in our round-up, but it also fills a very specific, very portable niche. That's more than I can say of the Acer Aspire E-15, for instance—a relatively powerful machine that unfortunately does nothing to distinguish itself from Toshiba's more powerful C55-C. The Switch 10 stands out, and there are plenty of valid reasons why you might choose to carry one. Would I use it as my default machine? Probably not. It's a bit too small and slow for it to be someone's primary device, I think. But it would be great as a situational supplement to a better-equipped computer. It's a laptop. It's a tablet. It's the Acer Aspire Switch 10 E, and it's here to try and prove hybrids don't have to be terrible.